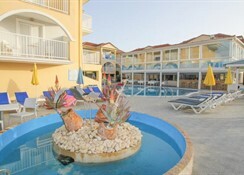 Filoxenia Hotel is a two-star hotel that offers all-inclusive accommodations to travellers for a relaxed holiday in Zante. 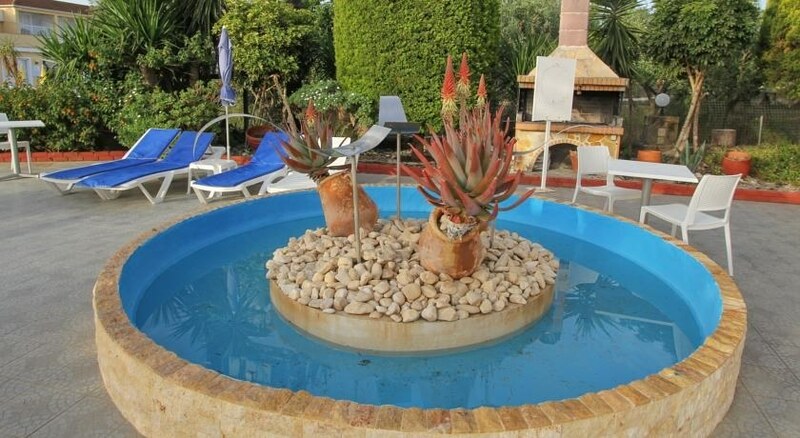 The hotel is mostly visited by families and couples because of the amicable hospitality it offers. Filoxenia Hotel houses 100 modern guestrooms all furnished with functional kitchenette, en suite with bath amenities, and private balcony. Rooms feature different theme and décor, mostly dominated by hues of red and blue colours. You will find fridge, microwave, cutleries, electric hob, toaster and such other basic kitchenware in the kitchen. Most of the accommodations have twin beds—double bed can be requested, and do contact the front desk for extra bed and crib. Other facilities common in the rooms are telephone, air conditioning, safe deposit box, hairdryer, sofa bed, and dining table and chairs. Rooms overlook the pool area and the mountains—and they are cleaned every day, and fresh towels and linens are provided daily. The main restaurant serves breakfast (8am to 10am), lunch (12:30pm to 2:30pm) and dinner (7pm to 9:30pm) in international buffet style. It features various specialities at lunch and dinner, complimented by wine and alcoholic drinks. Breakfast is mostly continental, and do inform the management in case you’re on a restricted or special diet. The hotel also features a poolside bar that serves an array of hot and cold and alcoholic and non-alcoholic beverages from morning till mid-afternoon. 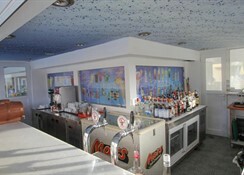 And in addition, the main bar serves an extensive menu, catering to cocktails, mocktails, beers, wine and other alcoholic drinks—this is also where most of the evening animations take place. Snacks buffet is served between 3:30pm to 4:30pm; and afternoon snacks and tea are between 4:30pm to 5:30pm. 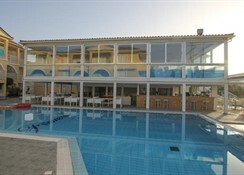 There are two outdoor swimming pools, one for adults and the other for kids. Parasols and loungers are available around the pools, and you can play water gymnasium, aqua aerobic, water polo and water volleyball. There is a well-maintained playground for kids; and for adults a game arcade that houses billiards, table tennis, darts and more. You can visit the common TV lounge or play mini soccer in the garden, or catch the hotel’s shuttle and go to the beach where you can go sailing, snorkelling, scuba diving, fishing, jet skiing, kite sailing and more. This is also a pleasant neighbourhood to rent a bike and go exploring the surrounding. 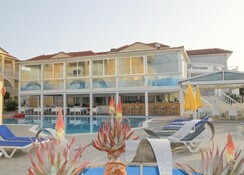 And in the evening, sit for the fabulous entertainments, such as Greek nights, cultural shows and other lively events. 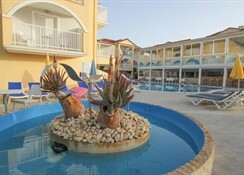 Located in Tsilivi (Zante), Filoxenia Hotel is a two-star property that is built in a quiet neighbourhood. The hotel is surrounded by farmlands on all side, offering picturesque views of the surroundings. The beach is nearly two kilometres away from the hotel—do note there are many beaches you can possibly explore. The beach offers tons of motorised and non-motorised water sports activities, but you can also consider visiting Tsilivi Water Park (2.8 km), an ideal place for families. There are couple of shops near the hotel, but most of the shops, restaurants and cafes are near the beach. Driving through the coastline and exploring the neighbouring towns is almost a tradition among travellers in Zante—some places to consider are Planos (2 km), Zakinthos (4 km), and Bochali (3 km). The nearest harbour is about 5 km away, located in Zakinthos, and the distance to the nearest airport, Zakinthos Airport is 8 km. We stayed at the Filoxenia for 4 nights for our Honeymoon at the beginning of May and I have to say it was amazing. We were greeted by 2 lovely ladies at reception who made us feel very welcome and whilst we were filling out the forms we were bought a very nice welcome drink. When we got to our room, there was an ice bucket with a lovely bottle of sparkling wine with a note from the hotel congratulating us and wishing us a happy honeymoon. The room which was really spacious and nicely decorated was extremely clean, along with the rest of the hotel. The room was cleaned every day with clean towels and bedding. The food is amazing, delicious greek food with lots of choice. My husband is a really fussy eater and normally when we go away he really struggles to find anything to eat, not here. He found something to eat every day and went back up for more every time. The staff were so friendly, especially Gramos, who told my hubby that if he could not find anything to eat, let him know what he would like and he would arrange to have it cooked for him. There are 2 pools and again it was so clean with towels provided by the hotel for round the pool. There are activities going on throughout the day and entertainment in the evening. Tsilivi town and beach is only about a 25 minute walk from the hotel and although they provide a minibus throughout the day we preferred to walk as we got to see so much more of such a beautiful town. We loved it here and have already booked to go back in October for 2 weeks with our little boy. can't wait.